When you manage a team of sales reps, your compensation structure determines the type of talent you’ll be able to hire. Not only do you want to attract and retain gifted sales reps, you want to motivate them to do the best job possible. 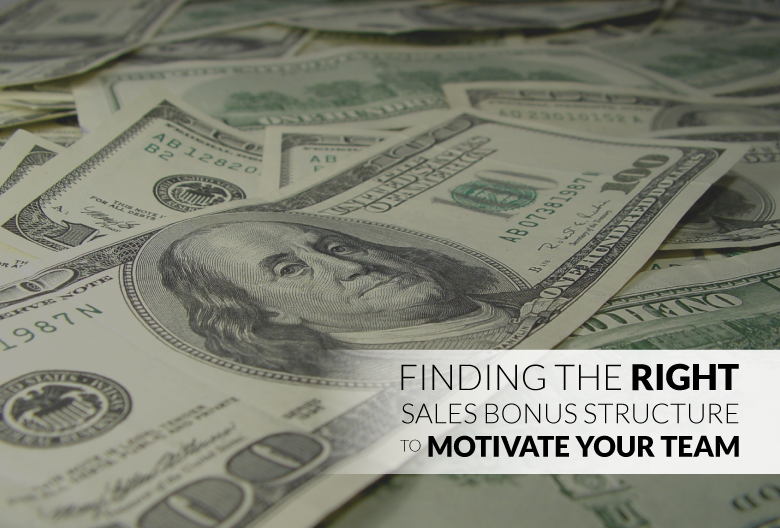 So, are sales bonuses the key to recruiting top sales reps to your company? How should you reward your best-performing employees for landing major clients? The answer is not always simple – should you offer bonuses or commission? Does a fixed salary or variable compensation make the most sense for your team? Let’s discuss the factors that will shape your decision. What is a Sales Bonus? A sales bonus is a monetary incentive received when a salesperson meets or exceeds a pre-defined goal. Sales bonuses might be expressed as a percentage of a cumulative revenue milestone – that is, a dollar amount awarded once a sales rep brings in a certain amount of revenue for a particular period. For instance, an individual rep might receive a $1000 sales bonus when they hit $10,000 in revenue for the quarter. Bonuses can also be structured around achievements not directly linked to revenue. For example, bonuses may be awarded based on how many units are sold, the number of new contracts signed, or how quickly new customers are moved through the sales cycle. When Should Sales Bonuses Be Used? It might seem obvious that bigger sales always deserve bigger rewards – but that’s not always the case. Depending on the business’s goals and each rep’s specific job duties, sales bonuses or commission might be an appropriate incentive, but it’s not right for every team. So, when does it make sense to offer sales bonuses? A good use cases for sales bonuses is in a company experiencing relatively slow growth. Bonuses can encourage reps to sell more and hopefully spur growth, but without requiring the company to pay more until it can afford to. For instance, your bonus structure might offer a reward that isn’t paid out until a certain revenue threshold it met. 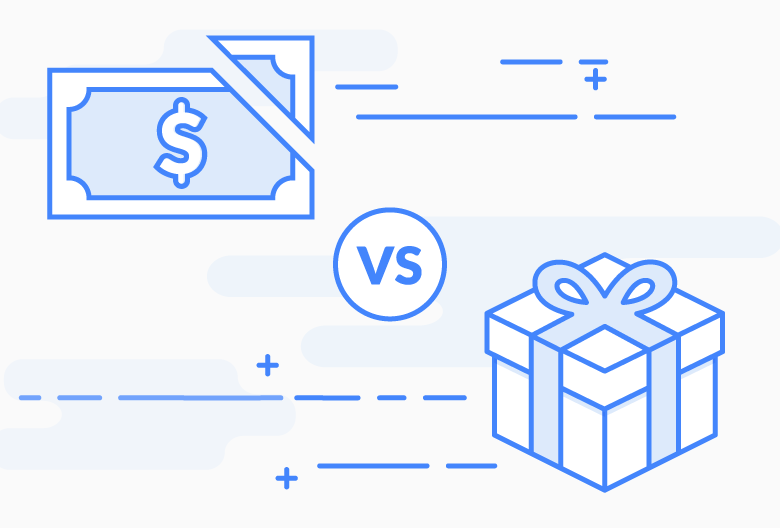 Sales bonuses are also a useful tool if success is defined by factors other than revenue – such as reducing customer churn rate, increasing customer satisfaction, and improving your net promoter score. For example, in some organizations, sales reps do much more than close new deals and onboard new clients. If the business wants to emphasize the importance of sustaining revenue from existing customers, there might be a bonus for increasing customer lifetime value by a certain length. What’s the Difference Between Commission and Bonuses? Unlike sales bonuses, commissions are always calculated based on a percentage of the overall sale value – whether in volume of units sold or revenue brought in. For example, for every $1 of revenue earned, reps receive a percentage of the sale as compensation. Commission-based compensation structures are good in cases where reps are expected to bring in new business rather than maintain existing accounts. The more they sell, the more they make. Offering commission instead of bonuses tends to make sense if the company is growing quickly, focused on increasing revenue, or is struggling to set clear, attainable sales quotas. Reps selling products with shorter sales cycles or working for lower base pay are also good candidates for commission. To make things more complicated, you don’t have to choose just one or the other – sales bonuses or commissions – when developing a fair pay structure. There are several ways you can structure your sales compensation packages. Here are three possible types of compensation structures to consider. Although it’s somewhat unusual, some businesses do compensate their sales reps with a strict base salary – no bonuses or commission required. In order for a salary to attract talented sales professionals, it needs to be quite competitive. The biggest challenge with a fixed salary is motivating your sales team to push their limits and fight to make sales. Therefore, a salary-only compensation structure only works for organizations that require equal contributions from multiple team members to make a sale. That is, no single sales rep is solely responsible for a successful deal and most of your reps wear more than one professional hat. This is especially common in smaller businesses with tight-knit sales teams. 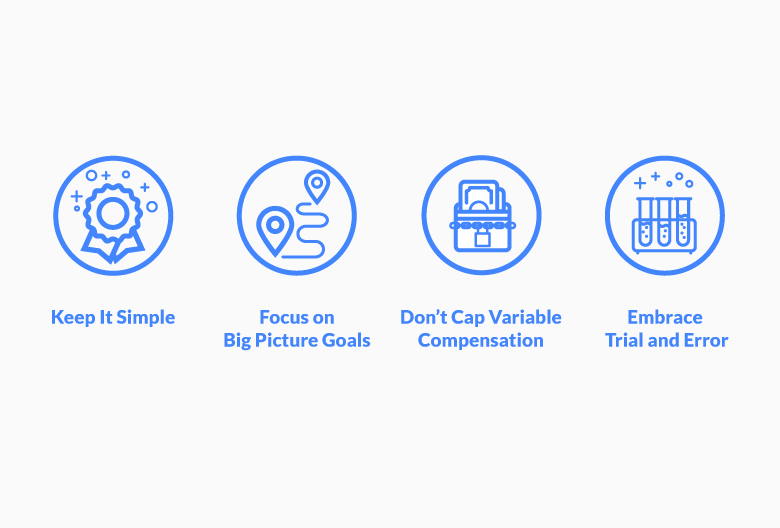 This is the most volatile and risky compensation structure from the perspective of your hires. A pay structure based purely on commission only rewards sales reps if they make a sale. It’s completely results-oriented and the amount reps can earn is directly influenced by how much they manage to sell. Of course, a commission-only pay structure will attract fewer applicants, but those who are interested are likely determine, hardworking, and self-confident. One major issue is that offering commission without a base pay creates a highly competitive environment. Since everyone’s neck is on the line and team members are direct threats to each other’s livelihood, tensions and stress levels will rise – along with employee turnover. This is likely the most popular compensation structures – and for good reason. With a guaranteed base salary and the potential to make more if they perform well, sales reps are motivated to maximize their productivity. Though the salary in this type of compensation structure is typically lower than a straight salary situation, it allows team members to earn an income even when they’re in training and during market lulls. Bonuses can only motivate your reps if they understand exactly what they must do to earn them. So, whether you offer a commission, bonuses, or combination of both, make sure everyone understands what metrics are being measured and how much they can earn. The whole point of offering sales bonuses or commissions is to incentivize your team to work towards the goals that matter most. Develop your sales bonus structure around specific objectives – whether that’s increasing cash flow, scheduling a certain number of meetings, or keeping existing customers happy. Placing a limit on how much a sales rep can earn places a limit on how hard they’re willing to work. Not only does it hurt team morale, but capping variable compensation discourages reps from going above and beyond once they’ve maxed out their earning potential for a given period. When creating a sales compensation structure or deciding how to award bonuses, play around with different combinations of salary, bonuses, and commission to see what motivates your reps. Commissions and bonuses can be used together to create an ideal sales compensation package.